We began our full-time travels in May, 2007, and have had lots of adventures since then. This website was built using Shutterbug by XtraLean Software, and all the posts from those earliest days through June, 2012 retain the format of that earlier edition of the website. To read the travel pages sequentially (I’ve been told our site reads like a novel that way), there is blue highlighted text at the beginning and end of each post linking it to the next and previous posts, or look for arrows at the bottom of each post. From July 2012 to October 2012 we traveled by RV. From October 2012 to December 2013 we traveled by sailboat. From January 2014 to the present we traveled by RV. Spring Has Sprung! – Sweet Days at Roosevelt Lake, Arizona April 20, 2019Roosevelt Lake in Arizona is a beautiful place to enjoy the unfolding of spring! Here are some pics. Black Hills Back Country Byway – Spring Flowers in Arizona! April 12, 2019The Black Hills National Back Country Byway is a lovely historic 21 mile 4×4 road between Safford and Morenci in eastern Arizona. SE Utah – A Mars Colony, Wide-Angle Photography & Snowy Mountains! March 22, 2019On an RV trip to southeastern Utah we found a Mars colony, some beautiful wide angle photo ops and snowy mountains! Monument Valley & Hite Scenic Overlook – Stone Towers from Below & Above! March 15, 2019A southern Utah RV trip visits Monument Valley, Mexican Hat and the Lake Powell Hite Scenic Overlook – great photo ops! Castle Hot Springs and Other AZ Treasures near Lake Pleasant March 2, 2019Castle Hot Springs Resort has been renovated, and driving there past Lake Pleasant we saw classic Sonoran Desert Scenery. Rainbows and Wild Horses in the Arizona Desert! February 8, 2019Seeking adventure in Arizona, we found some very tame wild horses and saw some vivid rainbows reflected across a lake. Canyon Country Highlights – Lake Powell, Horseshoe Bend & More! February 1, 2019The drive from Bryce Canyon to Horseshoe Bend crosses gorgeous Canyon Country at Lake Powell (Glen Canyon) and Red Canyon. Bryce Canyon in Winter – Snow and Lace on the Red Rock Spires! January 25, 2019Bryce Canyon National Park became a GORGEOUS land of snowy spires and fairytale turrets after a winter blizzard. Here are pics! Grand Canyon – A Winter Wonderland with Snow! January 18, 2019Grand Canyon National Park is a gorgeous Winter Wonderland when it is filled with snow. Here are pics from our blizzard adventure! Jerome, Arizona – A New Year’s Getaway in the Snow! January 4, 2019A winter escape from the Sonoran Desert to Jerome Arizona for snow makes a delightful New Year’s Day excursion. Cross-Country Highlights on an RV trip from Indiana to Texas December 14, 2018On an RV trip through middle America we found special highlights off the beaten path in Illinois, Oklahoma and Texas. Oliver Lee Memorial State Park, New Mexico – A Dog’s Eye View! November 30, 2018Oliver Lee Memorial State Park near Alamagordo, New Mexico, is an RV dog’s dream with a beautiful hiking trail into Dog Canyon. RVing Through History – 80 Years of RV Travel! November 9, 2018A look through some antique trailer magazines from 1937 to the present shows not much has changed in 80 years of RV travel! RV/MH Hall of Fame + Elkhart (RV Heart) Indiana November 2, 2018The RV/MH Hall of Fame and Museum showcases the history of the RV industry in Elkhart Indiana with fantastic antique trailers. Halloween Camping – RV Witches & Goblins at Michigan State Parks! October 26, 2018Halloween camping at Michigan State Parks has ghosts and skeletons at every RV campsite and kids trick-or-treat at night. Fall Foliage in Michigan’s U.P. + Lake Superior at Sunset October 12, 2018The fall foliage color in Michigan’s Upper Peninsula & sunsets on Lake Superior are spectacular. Here are pics from our RV trip! Waterfalls in Michigan’s U.P. – Taquamenon, Bond Falls & Black River Jewels October 5, 2018On an RV trip in Michigan’s Upper Peninsula we saw Bond Falls, Taquamenon Falls, Gorge, Rainbow and Sandstone Falls – Awesome! Wisconsin’s Lake Superior Shoreline – Cute Towns & Great Sunsets! September 28, 2018On an RV trip along Lake Superior in Wisconsin we discovered charming small towns, great beaches and beautiful sunsets! Walker, Minnesota – A Hidden Jewel in the 10,000 Lakes September 21, 2018Amid Minnesota’s 10,000 lakes the hidden jewel of Walker on Leech Lake treated us to an Ethnic Festival parade and Corvette show. Soap Box Derby & Barrel Races – A Labor Day to Remember! September 7, 2018The Soap Box Derby and horseback Barrel Races were highlights of the Buffalo, South Dakota, Labor Day celebrations. A Smoky Moon, Badlands & Hummingbirds on the South Dakota Prairie August 31, 2018From a red smoky moon to badlands to hummingbirds, we saw some unusual things on our RV trip in the South Dakota Prairie. Summer Fun in Wyoming’s Big Horn Mountains August 10, 2018Wyoming’s Big Horn Mountains are filled with summertime fun in both Buffalo and Sheridan as well as the in mountain landscapes! Bighorn Canyon – A River Runs Through It in Montana! July 27, 2018Bighorn Canyon National Recreation Area is an ideal RV destination with glorious views at Devil’s Canyon Overlook and great red rocks. Wildflowers in Wyoming – Spring Showers Bring Spectacular July Flowers!! July 13, 2018The wildflowers in Wyoming were absolutely stunning this year. After a very rainy Spring, the meadows were filled with flowers in July. Beartooth Highway Scenic Drive – Dazzling All American Road – WOW!! July 6, 2018The Beartooth Highway is a jaw-dropping scenic drive in Montana & Wyoming that is an All American Road. Here’s pics… WOW!!! 4th of July in Cody, Wyoming – The Cody Stampede Parade! July 4, 2018Wyoming’s Cody Stampede Parade on the 4th of July is full of fun with cool floats, rodeo queens, marching bands and cute kids! RVing Central Montana – Great Falls, Cool Coffee & Amish Buggies June 29, 2018On an RV trip through central Montana we visited the village of Choteau, the Great Falls of the Missouri River and the town of Harlowton. Glacier National Park’s “Many Glacier” – Crown of the Continent! June 22, 2018Many Glacier embraces some of the best views and vistas in Waterton-Glacier National Park, an ideal destination for an RV trip. East Glacier Scenic Drive – Treasures OUTSIDE Glacier National Park June 15, 2018East Glacier National Park may be the prettier side of the Park for an RV trip; the Scenic Drive OUTSIDE the Park is GORGEOUS! Montana Road Trip – Wildflowers, Bison, a Mission Church + Good Eats! June 8, 2018On a Montana road trip we saw wildflowers in the National Bison Range & artwork in St. Ignatius Mission + good eats along the way. RVing Wyoming – Lakes, Mountains and Waterfalls June 1, 2018Wyoming’s Bighorn Scenic Byway is a great trip even with an RV, especially Shell Falls, and Keyhole Reservoir & Lake De Smet are lovely. Bear Lake, Utah – A Turquoise Paradise in Snowy Mountains May 11, 2018Bear Lake, Utah, is a wonderful RV trip destination, even off-season, offering lakeside campground and lots of stunning scenery. Utah Back Roads – Lakeside RVing Near Salt Lake City April 30, 2018A back roads RV trip near Salt Lake City Utah offers snowy mountains and lake views at Rockport, Echo, Pineview & Mantua Reservoirs. Escapod Teardrop Trailers – Rugged Campers for Off-Road Adventure! April 27, 2018Escapod teardrop trailers are rugged, purpose-built high quality campers made for back country off-road camping and adventure. Strawberry Reservoir, Utah – Springtime Beauty with Ice & Snow! April 23, 2018Strawberry Reservoir in Utah is a popular RV destination in Summer for fishermen, but the ice, snow and solitude were spellbinding in Spring! Goblin Valley State Park Utah – One Gigantic Playground! April 20, 2018Goblin Valley State Park in Utah is a fabulous destination for a family RV trip because it’s a gigantic kids’ playground! Utah Scenic Byway 24 RV Trip – Capitol Reef National Park April 16, 2018Utah Scenic Byway 24 is one of America’s most stunning drives. Here’s the view from the passenger seat going west to east! A Back Roads RV Trip – AZ to NV to UT – Colorado River & Spanish Trail April 13, 2018Taking an RV trip on back roads, we followed the Colorado River from Arizona to Nevada and the Spanish Trail into Utah. Waterfront Dining in Arizona – Scorpion Bay & River’s Edge Cantina March 30, 2018Scorpion Bay Grill at Lake Pleasant and the River’s Edge Cantina on the Colorado River in Parker offer waterfront dining in Arizona. Wild Burros of the Colorado River – A Puppy’s View! March 16, 2018On the scenic drive between Parker Arizona and the Parker Dam we met a family of wild burros and introduced our puppy to them! Magical Moments in the RV Life March 2, 2018Some magical moments from our RV lifestyle this week: balloons flying overhead, a bald eagle sighting and a fabulous full moon. Lost Dutchman State Park Campground – Arizona Gold in the Superstitions February 15, 2018Lost Dutchman State Park RV Campground on the edge of Arizona’s stunning Superstition Mountains is a favorite among RVers. Dolly Steamboat – Gliding Through the Arizona Desert on Canyon Lake February 9, 2018The Dolly Steamboat cruise on Canyon Lake is a great way to see some of Arizona’s best desert scenery–from the deck of a boat! Lake Pleasant & Canyon Lake – Waterfront Camping in Arizona’s Sonoran Desert February 2, 2018Some of Arizona’s best RV camping is at the Sonoran Desert lakes. Here’s a look at Lake Pleasant and Canyon Lake in Phoenix. Fall River Balloon Festival in Hot Springs, South Dakota January 19, 2018The Fall River Balloon Festival is a delightful summertime gathering of balloonists on the air strip at Hot Springs Airport South Dakota. Ranch Sorting Competition – Cowboy Adventures in Phoenix Arizona December 29, 2017A ranch sorting competition (also known as “cow sorting” & “cattle sorting”) was a fun immersion in western cowboy culture on our Arizona RV trip. Lake Mead Scenic Drive + A Great RV Pit Stop at “Redstone” NV! December 14, 2017A scenic drive with our RV past Lake Mead was a fantastics way to avoid Las Vegas, and who knew there was a great picnic area at Redstone?! Sand Hollow Side-by-Side UTV/ATV Adventure Rally – Test Drives in the Dunes! November 26, 2017At the Sand Hollow Side-by-Side Adventure Rally Jamboree we had a blast doing UTV and ATV test drives in the dunes…! Picturesque Medieval Charm an Hour from Paris – Moret sur Loing October 20, 2017Moret sur Loing is a charming and picturesque Medieval French town an hour from Paris by train, ideal for a day trip from the big city! A Las Vegas Light Show — WOW!! October 6, 2017A spectacular lightning storm over a valley north of Las Vegas lit up the night skies with a stunning light show on a Nevada RV trip. An American in Paris – Ooh La La! September 30, 2017On a whirlwind weeklong trip to Paris I discovered the City of Light’s true charms, from canals to gardens to history and great food! Badlands National Park – Rugged Beauty on a South Dakota RV Trip September 21, 2017On a Badlands National Park RV trip in South Dakota we saw a big herd of bighorn sheep and lots of cute little prairie dogs! Wall Drug – An Iconic Pit Stop on a South Dakota RV Road Trip September 9, 2017Wall Drug Store is an iconic must-see all-American destination for RV road trippers heading to South Dakota. Here are some pics! Buffalo Wyoming – RVing Basque Style in the Bighorns! September 4, 2017Basque sheep herders in the Bighorns of Wyoming have been RVing in travel trailers for ages. Here’s a few of their wagons…! Buffalo Wyoming – Cowboys, Cowgirls and Sheriff Walt Longmire! August 27, 2017On an RV trip to Buffalo Wyoming we met cowboys and cowgirls, watched a rodeo and even saw a parade for Walt Longmire! Solar Eclipse 2017: Time-Lapse Videos from the South Dakota Badlands August 21, 2017From the 2017 Solar Eclipse in South Dakota’s Badlands, here are time-lapse videos of the changing light and bighorn sheep napping! Eastern Wyoming Small Towns – An RV Trip through Wyoming’s Quiet Side! August 15, 2017On an RV trip through eastern Wyoming we found charming small towns at Chugwater, Douglas, Newcastle, Sundance and Buffalo! Sturgis Motorcycle Rally – Wild and Free in South Dakota’s Black Hills! August 10, 2017The Sturgis Motorcycle Rally in South Dakota’s Black Hills is a total blast & we swung by in our RV to get a glimpse this year…WOW! Custer South Dakota Highlights on an RV Trip August 6, 2017Custer, South Dakota, is a wonderful RV trip destination where we found history, scenic beauty, great biking and yummy treats! Custer State Park Burros & Bison – Close Encounters of the Animal Kind July 31, 2017The highlight of our RV trip to Custer State Park was mingling with the begging burros and being surrounded by a buffalo herd. Custer State Park Wildlife Loop Road – Where the Animals Are! July 26, 2017The Wildlife Loop Road in Custer State Park (a super RV stop) is full of wild animals from bison to burros to birds to prairie dogs! Colorado’s Stunning Scenic Drives…by Porsche! July 23, 2017On a Colorado RV trip we joined friends on a Porsche 356 club rally, driving over mountain passes & seeing exquisite alpine scenery. Black Hills National Forest, SD, RV Boondocking – Camping with Cows! July 11, 2017RV boondocking in Black Hills National Forest South Dakota is truly peaceful, but sometimes you get strange neighbors — like cows! Valles Caldera National Preserve & a Spring Blizzard in New Mexico! June 28, 2017Valles Caldera National Preserve is a brand new recreation area in New Mexico. On a May RV trip there we got a blizzard! Tent Rocks National Monument (Kasha-Katuwe) – Hiking Slots & Spires! June 17, 2017Kasha-Katuwe Tent Rocks National Monument is a great hike through a slot canyon & up a steep climb to true tent shaoed rocks. Aztec Ruins National Monument – Whispers from the Ancients in New Mexico! June 11, 2017An RV trip to the 400-room structure at Aztec Ruins National Monument in New Mexico offers a fascinating look at the ancients. Eggs & Aliens in Bisti/De-Na-Zin Wilderness (Bisti Badlands) May 15, 2017The Bisti/De-Na-Zin Wilderness is an outdoor lover’s paradise with fun hikes to exotic rock hoodoos shaped like alien eggs! Canyon de Chelly – Breathtaking Views Under Vibrant Skies May 9, 2017Canyon de Chelly National Monument has breathtaking overlooks that come alive at sunrise and sunset, great for an RV road trip! Blue Mesa Trail – Lavender Beauty in Petrified Forest National Park May 5, 2017On an RV trip to Petrified Forest National Park we discovered gorgeous lavender hills and petrified logs on Blue Mesa Trail. Petrified Forest National Park RV Trip – Magic in Jasper Forest April 28, 2017On an RV trip to Petrified Forest National Park calcified stone tree logs came to life on the Jasper Forest “Off the Beaten Path” hiking trail. Getting Our Kicks on Route 66 by RV in AZ – Cool Springs, Winslow & Holbrook April 24, 2017Get your kicks on Route 66 by RV & see Arizona’s Cool Springs Station, La Posada Hotel in Winslow & Wigwam Motel in Holbrook. RV Camping with the Rock Art Petroglyphs in Gila Bend, AZ April 21, 2017Painted Rock Petroglyph Site near Gila Bend, Arizona, is loaded with ancient rock art and there’s a sweet little RV campground too. Snorkeling Ko Rok with Dive & Relax – Underwater Magic in Thailand! March 31, 2017Our Ko Rok snorkeling trip with Dive and Relax was a blast — pretty fish and vibrant reefs were highlights of an intimate tour. Kanchanaburi, Thailand – History, Caves, Monkeys & Exotic Fruit! March 3, 2017On a custom private tour with Mellow Adventures we saw the Death Railway, Lawa Cave and other Kanchanaburi highlights. Erawan Falls – Jewel of Erawan National Park – with Mellow Adventures February 7, 2017Mellow Adventures Review: An incredible visit to Erawan Falls at Erawan National Park in Kanchanaburi Thailand – Serenity & beauty! One Day in Bangkok – A trip on the Chao Phraya Tourist Boat! January 18, 2017With just one day in Bangkok Thailand, a fun tour is the Chao Phraya tourist boat hop-on-hop-off ticket. Here are some tips. Zion National Park “West” RV Trip – Gorgeous Kolob Canyons! December 22, 2016Kolob Canyons, gorgeous and lesser known in Zion National Park, is a must see on an RV trip, esp. hiking Taylor Creek Trail in Fall. Zion National Park RV Trip – One AWESOME Canyon! December 15, 2016Zion National Park is an awesome RV trip destination with towering rock walls, great hikes and bike rides. Here are pics and tips! Grand Canyon’s North Rim – Magnificent & Intimate by Day or Night! December 6, 2016The North Rim of the Grand Canyon is magnificent yet intimate…here are photos from our RV trip across northern Arizona! “Cliff Dwellers” on Arizona’s Vermillion Cliffs Scenic Drive – A Fun Stop! December 3, 2016An RV trip through the Vermillion Cliffs in NE Arizona is an eye-popping red rock drive, and Cliff Dwellers is a fun roadside stop. Cowboy Poetry Gatherings in Durango, Colorado, and Alpine, Texas! November 30, 2016Cowboy poetry gatherings in Durango Colorado and Alpine Texas are a fun way to glimpse of the past in the American West. The Burr Trail – A Fabulous Side Trip on Utah’s Scenic Byway 12 November 15, 2016The Burr Trail is a wonderful side trip through a red rock canyon that begins on the famous Scenic Byway 12 in Boulder Utah. Utah Scenic Byway 12 RV Trip – Driving An All American Road! November 3, 2016An RV trip on Utah’s Scenic Byway 12 is a wondrous immersion in sweeping vistas, steep climbs and descents, and breathtaking views. Bryce Canyon – Rainbow Point – Bristlecone Pines and Sweeping Vistas November 1, 2016Bristlecone Trail at Rainbow Point in Bryce Canyon National Park is an easy hike that passes sweeping views and ancient trees. Bryce Canyon National Park – “Mossy Cave” – Mystery Waterfall! October 18, 2016Bryce Canyon National Park is known for its red rock pinnacles, but there is a beautiful waterfall at Mossy Cave too!! Red Canyon Utah and the Bryce Canyon Bike Trail! October 13, 2016Red Canyon is a stunning spot to camp and hike just outside Bryce Canyon and a bike trail connects the two canyons together. Bryce Canyon National Park – Fairyland Trail – A Beautiful Hike! October 2, 2016The Fairyland Trail at Bryce Canyon National Park is a quiet and stunning hike that wanders between the red rock hoodoos. Bryce Canyon – Hiking The Rim & Navajo Loop + A Tourist Time-lapse! September 29, 2016Bryce Canyon National Park’s most popular hikes are the Rim and Navajo Loop Trails. How busy are they? Check out the time-lapse! Bryce Canyon National Park – Inspiration Point – OMG! September 27, 2016Bryce Canyon National Park is a MUST SEE for everyone exploring the west in an RV – Inspiration Point is a jaw-dropper! Cedar Breaks National Monument – A Hidden Jewel in Utah September 23, 2016Cedar Breaks National Monument is a hidden Utah jewel that’s easy for RV travelers to miss when visiting the bigger National Parks. “Healer of Angels” – The Eagle Whisperer – Martin Tyner of Southwest Wildlife Foundation September 18, 2016Martin Tyner of Southwest Wildlife Foundation rehabilitates and releases eagles back to the wild, carrying prayers to the heavens. Sun Valley Idaho – An RV Traveler’s Delight in Ketchum, ID! September 16, 2016Sun Valley Idaho is a great RV travel destination with loads of outdoor activities and free symphony concerts in August. McCall, Idaho – Summer Beach Fun on Pretty Payette Lake September 14, 2016McCall, Idaho, is a charming town overlooking pretty Payette Lake where beach lovers and boaters play in the sand and water. An Idaho Panhandle RV Trip on US-95: Sandpoint, Moscow & McCall September 10, 2016On an RV trip down US-95 in Idaho’s panhandle, we visited Sandpoint, Moscow and McCall where beaches and cute bistros reign. Ross Creek Cedars & Kootenai Falls – Giant Trees & Swings in Montana! September 3, 2016In our RV trip to NW Montana we found giant ancient trees at Ross Creek Cedars Scenic Area and we swung over Kootenai Falls! Eagles and Hummingbirds in Libby, Montana August 31, 2016While RV camping in Libby Montana we had close encounters with a beautiful bald eagle and a flock of hummingbirds. Long Ride Travel by Horse and Bicycle! August 29, 2016Traveling by RV is a blast and has introduced us to more exotic ways to see the world: Long Ride horse travel and bicycle touring. Whitefish to Libby – Big Surprises on the Back Roads of Montana August 28, 2016On an RV trip on Montana’s back roads from Glacier to Whitefish and along Lake Koocanusa to Libby, we found some big surprises. “Going to the Sun” from Glacier National Park’s East Side – Breathtaking! August 21, 2016Driving the Going to the Sun Road from Glacier National Park’s east side offers breathtaking views of snowy peaks, lakes and valleys. Glacier National Park’s Quieter Side – Saint Mary August 17, 2016The eastern side of Glacier National Park is its quieter and possibly more beautiful side, and St Mary is a great RV home base. Waterton Lakes Nat’l Park – Starry Skies, the Milky Way & Wildflowers August 9, 2016Waterton Lakes National Park in Canada’s starry night skies are dark enough to see the Milky Way, great fun on an RV trip! Waterton Shoreline Cruise – A Classy Tour of Waterton-Glacier NP August 5, 2016The Waterton Lakes Shoreline Cruise was the highlight of our stay in Waterton-Glacier National Park and is a great way to see the park. Waterton Lakes National Park – Rocky Mountain High! July 28, 2016Waterton Lakes National Park is a phenomenal place for an RV trip, with glorious scenery, campsites on the lake and a sweet town. Kananaskis Country – Canadian Rockies Beauty Off the Beaten Path July 23, 2016An RV trip to Canada’s Kananaskis Country serves up stunning Rocky Mountains beauty a little ways off the beaten path. Canmore, Alberta – An Outdoor Lover’s Town in the Rocky Mountains July 17, 2016Canmore is a cute mountain town nestled into Canada’s Rocky Mountains where lovely bike trails wander through exquisite views. Jasper National Park – Columbia Icefields & Athabasca Falls July 12, 2016The Columbia Icefields are a highlight on the Icefields Parkway in Jasper National Park, and Athabasca Falls is a delight at sunrise. Banff, Alberta – A Grand Resort Town in the Canadian Rockies July 3, 2016Banff is a beautiful, grand resort town with historic roots that is nestled in the beautiful Canadian Rockies, ideal for an RV road trip! Yoho National Park – Emerald Lake & Natural Bridge – Aqua Magic! June 26, 2016Emerald Lake and Natural Bridge are great highlights at Yoho National Park in the Canadian Rockies where we found Agua Magic! Moraine Lake – Crown Jewel of Banff National Park June 19, 2016Moraine Lake is the crown jewel of Banff National Park and is a “must see” on any visit to Lake Louise whether by bike, by RV or by car. Icefields Parkway – True Blue Lakes, Avalanches & Grouse! June 16, 2016In our RV adventure on the Icefields Parkway in Banff National Park we saw blue lakes, heard avalanches and played with grouse. Icefields Parkway – Canadian Rockies Scenic Drive – WOW! June 14, 2016The Icefields Parkway in Banff National Park is an eye-popping Canadian Rockies scenic drive well worthy of an RV road trip. Lake Louise – RV Travels to the Heart of the Rockies in Banff June 10, 2016Lake Louise is a great RV travel destination in Banff National Park (heart of the Canadian Rockies), and hiking to Lake Agnes is a must. Kootenay National Park Canada – Bears, Mountains & Rivers! June 7, 2016Koontenay National Park is a fun RV destination in Canada’s Rocky Mountains where bears are common and rivers are turquoise. Canadian Rockies – Big Mountains & Bighorn Sheep! June 2, 2016On an RV road trip into the Canadian Rockies we found ourselves surrounded by very tall mountains and big horn sheep too! Glacier National Park in Montana – Mirrors at Lake McDonald May 29, 2016Glacier National Park is great for an RV roadtrip, and going before peak season avoids the crowds, especially at serene Lake McDonald. Philipsburg, Montana – One of America’s Prettiest Painted Places! May 24, 2016Philipsburg, Montana, is one of “America’s Prettiest Painted Places” and is a is a great stop an RV road trip through Montana. A Glimpse of Cowboy Life and Cattle Ranching in Montana May 16, 2016Our RV travels took us to a cattle ranch in Montana where we learned about cowboy and ranching life and even bottle fed two calves. Montana’s Bitterroot Valley – Elk, Horses, Ranches & More! May 14, 2016The Bitterroot Valley of Montana is filled with pretty farms and is a great place to ride a horse. Sometimes herds of elk run by too! An RV Cruise Along Idaho’s Salmon River on US-93 May 8, 2016US-93 in Idaho runs along the Salmon River and is a very scenic drive for an RV trip to the towns of Challis and Salmon. A Backcountry RV Roadtrip in SE Idaho – Quiet Splendor! May 4, 2016An RV roadtrip on the backcountry roads of southeast Idaho showed us beautiful mountains, pretty pastures and sweet towns. Canyonlands National Park UT – Island in the Sky (and Night Skies!) April 28, 2016Canyonlands National Park in Utah offers both dramatic vistas and awesome night skies in the Island in the Sky district near Moab. Dead Horse Point State Park, Utah – Magical Sunrises! April 23, 2016Dead Horse Point State Park is one of Utah’s most spectacular canyon overlooks, and witnessing sunrise there is truly magical. Arches National Park Utah – A Playground of Soaring Red Rock Bridges! April 21, 2016Arches National Park in Utah is filled with soaring red rock sandstone bridges, a gorgeous playground that brings out the kid in everyone. Moab Utah – Red Rocks and Snowcapped Mountains April 14, 2016Moab Utah is an RV paradise near two National Parks, red rocks & snow-capped mountains ideal for hiking, biking and camping. Canyonlands National Park Utah – Hiking in the Needles District! April 12, 2016The Needles District of Canyonlands National Park in Utah is filled with pink spires best seen on the Chesler Park hike. Newspaper Rock Utah – Petroglyphs and Rock Art from the Ancients April 6, 2016Newspaper Rock in Utah is a rock art panel of Indian petroglyphs pecked out of the desert red rocks between 100 BC and 1540 AD. Valley of the Gods & Goosenecks State Park, Utah – Beautiful! April 4, 2016Valley of the Gods, UT, is a dramatic scenic drive like Monument Valley, while Goosenecks State Park is like of Horseshoe Bend, AZ. Navajo National Monument, Monument Valley and Bears Ears March 28, 2016Navajo National Monument has ancient cliff dwellings, Monument Valley has dramatic rock formations, and Bears Ears NM is PROPOSED. Lees Ferry & Marble Canyon AZ + Pretty Paria River Hike March 26, 2016Lees Ferry & Marble Canyon are an easy RV side trip from Arizona’s Vermillion Cliffs Scenic Byway where the Paria River meets the Colorado! Horseshoe Bend Overlook – Page, Arizona – Stunning! March 24, 2016Breathtaking Horseshoe Bend overlook near Page, Arizona, is ideal for a daytrip during an RV road trip through northeastern Arizona. Sedona Arizona – Brooding Skies at Sunset in the Red Rocks March 17, 2016Capturing a beautiful sunset over the red rocks of Sedona Arizona takes patience, but you can still get great photos while you wait! The Crack at Wet Beaver Creek (Bell Trail Hike), Sedona, AZ March 14, 2016Hiking the Bell Trail to The Crack at Wet Beaver Creek is an easy 3.5 mile walk to a beautiful gorge and swimming hole in the Sedona AZ red rocks. Sedona, Arizona – Great Beer, Coffee, Red Rocks & Psychics! March 9, 2016Sedona, Arizona, is a trendy vacation hot spot in the red rocks where outdoor lovers can find gourmet coffee, great beer, and psychics too! Bell Rock Pathway, Sedona AZ – Hiking & Biking the Red Rocks March 7, 2016Bell Rock Pathway in Sedona, Arizona, is an easy hiking and biking trail that immerses you right in the heart of the best of the red rocks! Arizona-Sonora Desert Museum – Wild Animals in Tucson AZ March 5, 2016The Arizona-Sonora Desert Museum in Tucson AZ houses wild animals along a labyrinth of paths and raptors fly free overhead twice a day! Old Adobe Doorways & An Evening Walk in Tucson AZ February 23, 2016Old Town Tucson Arizona is filled with charming old adobe doorways, a perfect warm-up for the Meet Me at Maynards evening walk downtown. Saguaro National Park Petroglyphs – Tucson Mountains, AZ February 20, 2016Amid the cactus studded hillsides of Saguaro National Park (Tucson Mountains) there are evocative petroglyphs at Signal Hill. San Xavier Mission – Spanish Colonial Architecture in Tucson AZ February 17, 2016The San Xavier Mission in Tucson Arizona is a lovingly restored 300 year old Spanish Colonial church that makes for a fun daytrip. Mexican Dentists – Finding Affordable Dental Care in Mexico February 12, 2016Finding affordable dental care in Mexico isn’t hard and the quality of Mexican dentists is terrific. Here are our experiences. 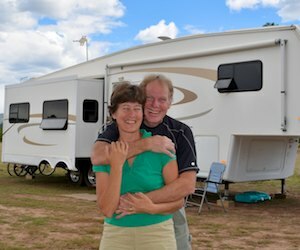 What’s It Like to RV in Quartzsite AZ? Anything Goes! February 2, 2016Quartzsite Arizona in January is a free-flowing RV gathering in the desert kinda like Burning Man or Woodstock for the senior set. Quartzsite RV Show – RV Stuff and So Much More! January 30, 2016The Quartzsite Sports, Vacation and RV Show draws a cast of thousands to camp in the Arizona desert every January. Quartzsite, Arizona – The RV Gathering Place January 26, 2016Quartzsite, Arizona, is The Gathering Place for winter snowbirds and RV travelers who camp in the desert for a few weeks each winter. ViewPoint RV & Golf Resort – RVer’s and Golfer’s Delight! January 22, 2016ViewPoint RV Golf & Resort is a lovely wintertime oasis for snowbird RVers with an 18 hole golf course and lots of great amenities. Alice Cooper Sells Us a New Truck! January 17, 2016After two years of researching and test driving diesel trucks all over the country, a sales pitch by Alice Cooper cinched our deal! Tonto National Monument AZ – Workamping with the Ancients! January 7, 2016At Tonto National Monument’s Upper Cliff Dwellings in Arizona, we learned about workamping and volunteering at archaeological sites. Monte Vista RV Resort in AZ – Arts, Crafts and Sports Fun! December 30, 2015Monte Vista RV Resort in Arizona is a classy, friendly RV park & mobile home community that’s great for arts, crafts and sports lovers. 2015 RV Travel Adventures – A Thrilling Journey East! December 26, 20152015 was an extraordinary year of RV travel as we criss-crossed North America in our ninth year of full-time RVing adventures. Merry Christmas – Arizona RV Style! December 23, 2015Merry Christmas to all our RVing friends. Here are some pics of RVs we’ve seen decorated for the holidays. So much fun!! Tonto National Monument AZ – Lower Cliff Dwellings December 16, 2015The Lower Cliff Dwellings at Tonto National Monument in Arizona are ancient Indian ruins high on a hill overlooking Roosevelt Lake. Copper Mines, NOT CAMPING, in Tonto National Forest – Why? December 13, 2015Tonto National Forest PUBLIC LAND goes PRIVATE with a foreign copper mine yet winter RV camping areas are closed forever. Why? Fall Color in Arizona’s Sonoran Desert near Roosevelt Lake December 10, 2015The Sonoran Desert near Roosevelt Lake AZ erupts in colors each fall as the riparian habitats show off autumn’s splendor. Swift Trail Scenic Drive up Mt. Graham – Autumn Color in Arizona December 7, 2015The Swift Trail Scenic Drive climbs Arizona’s Mt. Graham from the desert to ponderosa pine to aspen, an ideal autumn drive. City of Rocks State Park, NM – RV Camping in the Hoodoos! December 3, 2015City of Rocks State Park, New Mexico, is a fun spot for RV camping, with each campsite tucked into a cluster of exotic rock hoodoos! It IS Rocket Science at White Sands Missile Park in NM November 27, 2015White Sands Missile Range in New Mexico has a museum and outdoor Missile Park that resembles a rock garden for outdated missiles. Tatum, New Mexico – Metal Art Magic November 21, 2015In Tatum, New Mexico, there’s metal art magic around town courtesy of the workshops of Tex Welch and Juan Manuel Carbajal. Welch OK is A-Okay for a Fun Fall Fair in Oklahoma November 18, 2015Welch Oklahoma hosts a fun fall fair, the Welch OK Harvest Days. We saw it happening as we drove by in our RV, and we just had to stop! “America’s Heartland” – Is it in Kansas? November 12, 2015In our RV travels to Kansas we discovered pretty Tuttle Creek State Park and the unique Biblesta parade. Is this America’s Heartland? Space Craft RV Factory Tour – Custom 5th Wheels Made To Order! November 4, 2015Here’s a factory tour of RV builder Space Craft Manufacturing -custom designed fifth wheel trailers made to order with your specs! Thanks for the Great Times, Maysville KY!! November 1, 2015Maysville, Kentucky, was a highlight in our RV travels, and it was hard to say goodbye. Thanks for the great times and sweet memories! Maysville Kentucky – Tobacco, Freemasons, Miniatures & Clooneys! October 19, 2015From tobacco cutting to Freemason mysteries to world class miniatures and Clooneys, a visit to Maysville KY is a traveler’s delight. A Sweet Life on the Ohio River – Maysville, Kentucky October 4, 2015The mighty Ohio River has sculpted sweet Maysville Kentucky, giving it a highway to the world while also threatening to sweep it away. Maysville, Kentucky – Come for the History, Stay for the People! September 23, 2015Maysville, Kentucky, is a hidden gem on the Ohio River, full of pretty and historic buildings and overflowing with a welcoming spirit. An Amish Farmer’s Auction in the NY Finger Lakes September 13, 2015A special NY Finger Lakes gathering of Amish farmers gave us a priceless glimpse of yesteryear as they auctioned off their harvest. Watkins Glen State Park NY – Absolutely Breathtaking! September 10, 2015A series of downpours in Watkins Glen State Park made for some awesome photographs of waterfalls along the spectacular Gorge Trail. A Peek Inside the Amish Farms of the NY Finger Lakes September 5, 2015We had a rare opportunity to visit two Amish farms in the Finger Lakes of NY. In return, we gave the Amish a tour of our own buggy! Waterfalls, Wildlife & Wineries in New York’s Finger Lakes August 30, 2015With a winery every half mile, pretty farms, tame wildlife & gorgeous waterfalls, New York’s Finger Lakes make a great RV destination. Finger Lakes, New York – Seneca Falls & The Amish! August 24, 2015The Finger Lakes in New York are set between quiet farmlands that ooze tranquility – in between the clip-clop of Amish horses’ hooves! Mt. Washington Cog Railway – The Little Engine That Could! August 21, 2015The historic Mt. Washington Cog Railway is a fantastic train ride that goes straight to the summit on a special cog track. What a blast! Eastport and Bangor – Off the Beaten Path in Maine! August 18, 2015Eastport and Bangor are fun destinations in Maine that are often overlooked in favor of more popular destinations on the Maine coast. Cabot Trail Highlights – Nova Scotia’s Cape Breton Island August 14, 2015The Cabot Trail on Cape Breton Island in the northeastern corner of Nova Scotia passes by dramatic cliffs and cute fishing villages. Nova Scotia’s Northumberland Shore – The Quiet Side August 6, 2015Nova Scotia’s Northumberland Shore on the north coast is quiet and full of farmlands anchored by historic Pictou and Antigonish. Mahone Bay & Blue Rocks on Nova Scotia’s South Shore August 2, 2015Mahone Bay and Blue Rocks are tranquil villages on the south shore of Nova Scotia far from the hum of city life. Lunenburg, Nova Scotia – Pretty As A Picture! July 31, 2015Lunenburg, Nova Scotia, is a tourist’s and photographer’s delight with colorful buildings on the docks and pretty boats in the bay. Peggy’s Cove Lighthouse, Nova Scotia – Reflections At Sunset! July 24, 2015Peggy’s Cove, a quaint seaside hamlet, has one of the most beautiful lighthouses in Nova Scotia, especially during a spectacular sunset! Lubec & Campobello Island – Fantastic Lighthouses! July 17, 2015Lubec, Maine, and Campobello Island, New Brunswick, share more than an international border — both have gorgeous lighthouses! Taking the Mail Boat Ferry to Maine’s Cranberry Islands July 15, 2015A little mail boat ferry makes for a fabulous day trip out to Islesford and Great Cranberry Island from Mt. Desert Island in Maine. Beauty in the Mist – Bass Harbor Head Lighthouse, Maine July 10, 2015A misty morning and drizzly Maine day on Mt. Desert Island has a special charm in the harbors and at Bass Harbor Head Lighthouse. Acadia National Park’s Carriage Roads in Maine – Thanks, Rockefeller! July 7, 2015The Carriage Roads at Acadia National Park are a 50 mile trail system for non-motorized traffic courtesy of John D. Rockefeller, Jr.
Schoodic National Scenic Byway – Downeast Maine at its best! July 4, 2015The Schoodic National Scenic Byway is a delightful daytrip into “downeast” Maine away from the crowds of Acadia National Park. Acadia National Park – Alluring Beauty on the Maine Coast July 1, 2015Acadia National Park is home to some of the most beautiful scenery along Maine’s north coast, fabulous for an RV roadtrip! Narrows Too RV Resort – A Great Acadia National Park Home Base June 27, 2015An unexpected stay at scenic Narrows Too RV Resort in Maine made our visit to Acadia National Park a real dream come true! Blue Ridge Parkway (Virginia) – Waterfalls & Rhododendrons June 18, 2015In spring the waterfall hikes along Blue Ridge Parkway burst with the pink color of rhododendrons, but the hiking can be strenuous! Blue Ridge Parkway Highlights (Virginia) – Mills, Music & Farms! June 14, 2015The historic Mabry Mill and free concerts at the Blue Ridge Music Center are two highlights on the Blue Ridge Parkway in Virginia. New River Trail State Park – Galax, VA – Pizza, Beer and Biking! June 12, 2015The New River Trail State Park is a fabulous 57 mile rails-to-trails system for biking, hiking and camping out of Galax Virginia. Waterfalls of the Blue Ridge Parkway (North Carolina) June 10, 2015Soco Falls, Duggers Creek Falls and Crabtree Falls are three spectacular waterfalls for photos and hiking on the Blue Ridge Parkway. Blue Ridge Parkway (North Carolina) – Wildflowers Everywhere! June 7, 2015The Blue Ridge Parkway in N. Carolina is known for rhododendrons, but on our springtime RV trip the wildflowers were just as pretty! Smoky Mountain Adventures – Elk, Indians and Waterfalls May 31, 2015In North Carolina’s Smoky Mountains we found some great running trails, saw elk, hiked to waterfalls, and hung with the Indians! Great Smoky Mountains National Park – A First Glimpse May 25, 2015The mysterious Smoky Mountains – beautiful layers of mountains, rushing streams, lush vegetation and a canopy of trees over the roads. Georgia’s Antebellum Trail – Milledgeville, Eatonton & Madison May 23, 2015The Antebellum Trail in Georgia passes through historic small towns filled with graceful mansions that evoke another era. Thomasville, Georgia – Antebellum Elegance May 15, 2015Thomasville, Georgia, a small town of tree-lined streets and stunning antebellum mansions on wide lawns, comes to life in spring. Jungle Gardens in Sarasota Florida – It’s for the Birds! May 6, 2015Jungle Gardens in Sarasota is a kid’s playground full of exotic birds, and if you’re not a kid, going there makes you feel like one! The Ringling – The Art of the Circus in Sarasota, Florida April 27, 2015The Ringling is a huge estate in Sarasota Florida filled with original art by the European masters and the spirit of the circus too. Gulf Islands National Seashore – Florida’s Emerald Coast! April 17, 2015The Gulf Island National Seashore and Pensacola Beach are gems for RV travelers visiting Florida’s Emerald Coast. Rainbow’s End – Escapees RV Club Headquarters! April 14, 2015Escapees RV Club is headquartered on a huge campus in Livingston, Texas, a fascinating place for RV travelers to visit! Caverns of Sonora – Enchanting Caves in Texas April 6, 2015The Caverns of Sonora are an extensive cave system in Texas filled with exquisite calcite mineral formations. Boquillas del Carmen – A Taste of Mexico in Big Bend TX April 3, 2015A highlight of our trip to Big Bend National Park in Texas was visiting the tiny village of Boquillas del Carmen in Mexico. Terlingua, Texas – A Living Ghost Town in Big Bend March 28, 2015Terlingua, Texas, is a living ghost town in Big Bend, complete with an antique cemetery and new buildings built into ancient ruins. Big Bend National Park – Mountain, River & Desert Hikes March 19, 2015Big Bend National Park in Texas has all kinds of day hikes, from ascending mountains to walking beside rivers and through deserts. Big Bend National Park TX – Vast and Varied with Views! March 17, 2015Big Bend National Park is a huge park that is ideal for an RV trip, with mountains, a huge river, desert terrain and great views. Roswell, New Mexico – Aliens, UFO’s, Spaceships and more! March 11, 2015Roswell New Mexico was the site of a UFO crash landing in 1947, and today it is overrun with little green aliens! White Sands National Monument – New Mexico’s Desert Dunes! March 4, 2015White Sands National Monument in New Mexico is a fun park where you can make snow angels and go sledding in pure white sand. Arizona’s Eastern Chiricahuas – Finding Beauty in Devastation March 1, 2015Arizona’s Eastern Chiricahua Mountains have suffered terribly since 2011’s wildfire and 2014’s floods, but they are still lovely! Sandhill Cranes in Willcox Arizona – What a Party! February 21, 2015Sandhill cranes flock to Arizona and New Mexico each winter, and RV snowbirds can check out their feathered mates near Willcox! Florence, AZ – Few Tourists & Lots of Soul! February 13, 2015Florence, Arizona, is a small town between Phoenix and Tucson full of history and good vibes despite a lots of vacancies on Main Street. The RV Show in Quartzsite AZ – More Than Just RVs! February 7, 2015The RV Show in Quartzsite Arizona is a crazy mix of goodies for the RV lifestyle and elixirs for the aged! Flashback – Meeting Toller Cranston in Mexico January 29, 2015While visiting Guanajuato we met maverick skater & artist Toller Cranston at his home in San Miguel de Allende, Mexico. Quartzsite Arizona – RV Madness in the Desert! January 21, 2015RV snowbirds flock to Quartzsite AZ each January for the big RV show and transform the desert into a party on wheels. Balloons and VW Buses in Lake Havasu AZ January 17, 2015Taking a daytrip to see VW hippie microbuses in Lake Havasu Arizona, we bump into the Havasu Balloon Fest too! Cathedral Rock at Red Rock Crossing – Sedona AZ December 14, 2014Cathedral Rock reflected in pools of water at Red Rock Crossing is one of the quintessential images of Sedona. Mysteries in the Navajo Nation, Arizona November 29, 2014Leaving Colorado, we caught a glimpse of Monument Valley and discovered a hidden gem in the Navajo Nation in AZ. San Juan Mountains Colorado – And then it Snowed! November 14, 2014On our RV trip on the San Juan Skyway, the Colorado’s Rocky Mountains became a winter wonderland when it snowed in late fall. RV Trip on Colorado’s Million Dollar Highway – Ouray to Silverton November 2, 2014An RV trip on the Million Dollar Highway from Ouray to Silverton Colorado is breathtaking both for the scenery and because it is scary! Ouray – Finding the COLOR in Colorado on an RV Trip! October 26, 2014Late September to early October is the perfect time for an RV road trip to Ouray Colorado when the aspens light up the mountains. Black Canyon of the Gunnison National Park, CO – Steep and Deep! October 21, 2014The Black Canyon of the Gunnison National Park in Colorado is a land of wild and rugged beauty and very sheer cliffs! Romance at Maroon Bells Colorado! October 9, 2014Love was in the air at Maroon Bells in Colorado where we watched an engagement and a wedding photo shoot! Grand Teton National Park Wyoming – Rare Sightings! September 29, 2014We had some special sightings during our stay in Grand Teton National Park: rainbows, starry nights, fox, badger and leaping bison! Grand Teton National Park – 101 Ways to Enjoy The Tetons! September 20, 2014Grand Teton National Park is a place to be savored, and we discovered lots of ways folks do just that! Grand Teton National Park WY – Mirrored Waters September 17, 2014We loved the mirrored reflections of the stunning Grand Teton National Park mountains at Shwabacher’s Landing & Jenny Lake. Grand Teton National Park WY – Wild Skies September 10, 2014Fiery sunsets, mysterious mists, and rosy pink sunrises filled the skies at Grand Teton National Park. Craters of the Moon + Cataclysms from Sun Valley ID to Alpine WY September 2, 2014Volcanic cinders at Craters of the Moon NM capped our cataclysmic theme of wildfires and floods from Sun Valley ID to Alpine WY! The Artsy Side of Sun Valley, ID August 26, 2014Sun Valley has free goodies for every taste: art walks (with wine), symphony concerts, and camping. Ice Queens of Sun Valley, ID August 21, 2014After biking the trails between the mountains, we enjoyed some beautiful figure skating competitions in Sun Valley Idaho. Sun Valley Road Rally – Go Granny Go! August 16, 2014From an 81 year old granny to young gazillionaires racing Bugattis, the car racing was on at the Sun Valley Road Rally. Movin’ On Up to Sun Valley, ID August 12, 2014From Shoshone to Sun Valley, Idaho, we went from an old railroad town to a resort playground for the rich. Hell’s Canyon – A Gorgeous Gorge! August 7, 2014Hell’s Canyon is a gorgeous gorge that was carved between towering canyon walls by the Snake River. Hurricane Creek Wildflowers – Enterprise OR July 30, 2014The Hurricane Creek hiking trail inspired us with wildflower strewn meadows and snow-capped mountain peaks. Wallowa Lake Tramway – Into the Alps! July 23, 2014The Wallowa Lake Tramway is a sweet ride with breathtaking views 4000′ up to a mountaintop. Joseph Branch Railriders – What a ride! July 19, 2014The Joseph Branch Railriders excursion was a fantastic ride on special bikes designed to ride on the railways! Joseph, Oregon – At Heaven’s Door! July 15, 2014Joseph, Oregon, is a quiet, tiny town boasting mountain scenery that knocked our socks off! Baker City Cycling Classic July 11, 2014Racing bikes and Victorian architecture made for a perfect combo in Baker City, Oregon. On the road to Baker City, Oregon July 8, 2014The scenic drive to Baker City Oregon showcases many facets of the American West and ends in a charming city. Smoked out by a Wildfire! July 3, 2014The Two Bulls wildfire smoked us out of Bend, but we found safe haven a continued on. A Scenic Drive in Central Oregon June 26, 2014The scenic drives west of Bend offer up waterfalls, rushing rivers, fun wildlife and covered bridges. From Lakes to Rivers in Bend Oregon June 24, 2014We found beauty, hiking and biking galore along the rivers and lakes around Bend, Oregon. Crater Lake National Park in Oregon – Bluer than blue! June 13, 2014Crater Lake wowed us with stunning views of royal blue water, deep green trees and snow capped mountains. Into the Great Wide Open – Nevada to Oregon June 11, 2014What would you pay for a gallon of diesel when stranded with painted animals in the open desert? From Salt to Snow in Nevada – Bonneville to Lamoille Canyon June 6, 2014We went from salt to snow as we drove from the Bonneville Salt Flats to the Lamoille Canyon Scenic Byway. Nevada Open Road Challenge – A NEED for SPEED! May 30, 2014We mingled with race car drivers and admired their exotic cars at the Nevada Open Road Challenge! Paria Rimrocks “Toadstools” Hike to A Hidden Canyon! May 25, 2014A fun hiking trail in the Paria Rimrocks area called “The Toadstools” was bursting with wildflowers during our visit. Wire Pass Trail – Slot Canyon Hiking! May 22, 2014Wire Pass Trail (on the way to Buckskin Gulch Trail) has three fabulous slot canyons to slither through! Montezuma’s Castle & Schnebly Hill – Sedona Heights! May 19, 2014Montezuma’s Castle & Montezuma’s Well are wonderful daytrips from Sedona and Schnebly Hill Road is a thrilling scenic drive. Sedona Reflections on the West Fork Trail May 16, 2014Sedona’s West Fork Trail features gorgeous mirrored reflections from red rock cliffs and bright green trees. Sedona – Mountain biking in the red rocks! May 13, 2014Sedona is mountain biking heaven, but the challenges on the trails are just as dramatic as the scenery! Oh, Sedona – Scenic drives in the red rocks!! May 9, 2014Every road in Sedona Arizona is a “scenic drive” with majestic towering red rocks and spectacular views. Hunting Spring Wildflowers in Arizona May 5, 2014Hunting for spring wildflowers in central Arizona, we took several scenic drives to find them. Roosevelt Lake – Lakeside Camping in AZ May 1, 2014Roosevelt Lake near Phoenix AZ offers not only beautiful campsites but fascinating ancient Indian cliff dwellings close by. Wild Horses of the Salt River in Phoenix April 25, 2014After weeks of waiting, we had a thrilling encounter with the “wild” horses of the Salt River in Phoenix AZ. Phoenix on the Wing – Waterbirds of Arizona! March 27, 2014Nature abounds along the rivers in Phoenix, AZ. From bald eagles to dancing snowy egrets, we saw it all. The Wind Cave Hike in Phoenix AZ – The Hills are Alive! March 13, 2014Colorful lichen-covered cliffs and friendly chipmunks are highlights on the Wind Cave hike at Usery Mountain. Saguaro Lake – On the Waterfront in Phoenix February 27, 2014Pretty Saguaro Lake in the Phoenix area is a great spot to get a water fix in the desert! Saguaros and Sunsets in Phoenix Arizona January 31, 2014The sunsets and saguaro cactus around Phoenix kept us busy and our cameras happy! Phoenix Sonoran Preserve – A City Escape January 24, 2014The new Sonoran Desert Preserve offers breathtaking hiking in pristine desert, right in Phoenix! Arizona, Here We Come! January 12, 2014Goodbye Groovy — sigh — and Hello Trailer — yippee! San Diego Treats – Balboa and Sunset Cliffs December 20, 2013In San Diego, we were enchanted by both Balboa Park’s manicured gardens and lily pond and by nature’s raw beauty at Sunset Cliffs. On San Diego’s Shores – Dolphins and more! December 11, 2013On San Diego’s shores we got glimpses of distant voyages from other cruisers, but the leaping dolphins stole our hearts. San Diego’s Shelter Island – A Lively Waterfront! December 5, 2013Shelter Island delighted us with a Porshce car show and a tall ship parade, all of which happened right in our front yard. San Diego’s Shelter Island – Safe Haven! November 29, 2013San Diego’s Shelter Island offered an ideal oasis of tranquility where we slowly readjusted to the breakneck speed of life in America. Taylor Guitars – Where Passion Fuels Success November 24, 2013Our visit to the Taylor Guitars factory in El Cajon CA was awe inspiring because of the unique philosophy of its founder, Bob Taylor. The Baja Ha-Ha 2013 Sails South! October 29, 2013After a great kick-off party, the 2013 Baja Ha-ha cruisers rally set sail from San Diego on their way to Cabo San Lucas. Ensenada – A Triumphant Homecoming! September 23, 2013July, 2013 – Our return to Ensenada in northern Baja at the end of our Mexico voyage was satisfying in ways we never anticipated. Baja Bash (2) – Chased by a Hurricane! August 28, 2013Our Baja Bash excitement continued as Hurricane Erick chased us out of Cabo and barked at us all the way to Ensenada. Baja Bash (1) – Sailing on the Coattails of a Hurricane! August 8, 2013July, 2013 – We started our Baja Bash in Puerto Vallarta by sailing on the coattails of Hurricane Dalila to Cabo San Lucas. Yikes! Costalegre: La Manzanilla – Exotic animals & RVing Copper Canyon! July 25, 2013At Casa Maguey in La Manzanilla, we had fun with the locals and learned about the first RV train tour of Copper Canyon! Costalegre: Casa Maguey – Kindred spirits in a beachfront villa July 17, 2013During a fun week at Casa Maguey in La Manzanilla, we met kindred spirits and discovered our host grew up in an RV! Guanajuato – Full of Song and Spirit! June 24, 2013Guanauato, a UNESCO World Heritage Site, is not only colorful but a place where street music is elevated to high performance art. Guanajuato – Colors, stairs, tunnels and characters! June 14, 2013Guanajuato amazed us with its vivid colors, steep hills & deep tunnels. It’s a fun town with lots of character and characters! PV: Paradise Village Estuary – Birds, Iguanas, Crocs…and Dolphins? May 31, 2013Taking an estuary tour behind Paradise Village Marina, we found exotic birds, iguanas & crocs…and dolphins too! PV: Paradise Village Marina – A Resort Vacation! May 25, 2013At Paradise Village Marina we found ourselves vacationing at a high end resort filled with pools, beach bars, and exotic animals. PV: 2013 Kiteboard World Cup – Here on the beach! May 14, 2013The 2013 World Cup Kiteboard competitions took place right on our beach. What a thrill! PV: La Cruz – A Fun Artisan Market & Cruiser Hangout in Mexico May 5, 2013La Cruz is a favorite cruiser hangout and when we went to the Sunday farmer’s market we understood why — it’s fantastic!! PV: Chamela to La Cruz – Dances with Whales at Cabo Corrientes April 27, 2013Breaching humpback whales delighted us on our passage from Chamela to La Cruz in Banderas Bay. Costalegre: Careyes – The most colorful anchorage in Mexico! April 20, 2013Wow, talk about color! The tiny anchorage of Careyes is hard to park in, but the colorful views make it worth the effort! Costalegre: Paraiso – An Unexpected Tropical Oasis! April 13, 2013Paraiso is a tiny gem of an anchorage where we found clear turquoise water, thick swarms of fish, and a gorgeous beach. Costalegre: Cuastecomate – Exploring a “Secret Anchorage” April 6, 2013On our 2nd visit to the “Secret Anchorage” of Cuastecomate, we got ashore to the cute village behind the beach bars. Costalegre: Santiago – Brilliant sunrises every day! March 31, 2013In Santiago Bay we bolted out of bed every morning to watch the gorgeous sunrises, each more beautiful than the last. Costalegre: Manzanillo’s Las Hadas Resort – The Med in Mexico March 23, 2013Visiting Las Hadas in our third season aboard Groovy, we were charmed by its picturesque beauty once again!! Zihuatanejo – Nautical moments with Sail Fest and the pretty schooner Patricia Belle February 19, 2013Zihuatanejo’s Sail Fest and a tour of schooner Patricia Belle were highlights during our stay at anchor off Playa Las Gatas. Colorado GOLD – A Fall Foliage Photography Workshop October 21, 2012Colorado’s Dallas Divide between Ridgway and Telluride is a vivid kaleidoscope of color in autumn, ideal for a photo workshop. Ridgway, CO – Peak fall foliage on the Dallas Divide – WOW!! October 19, 2012Ridgway, Colorado, the San Juan mountains, Owl Creek Pass, Dallas Creek Rd and Last Dollar Rd make for a spectacular Fall RV trip. Colorado National Monument & Fruita CO – Red Rocks, Cycling & Wine! October 18, 2012Colorado National Monument’s red rocks are gorgeous, nearby Fruita has an awesome farmer’s market while Palisade has tasty wine! Dinosaur National Monument, UT – More than fossilized dinosaur bones! October 12, 2012Dinosaur National Monument in Utah and Colorado is home to Fremont petroglyphs, historic homesteads & great views. Vernal, UT – Colorful Gateway to Dinosaur National Monument October 5, 2012Vernal, Utah, is an inviting town that has a dinosaur on every street corner, setting the stage for nearby Dinosaur National Monument. Flaming Gorge Utah – Fiery canyons, a cool river, and nearly tame bighorn sheep October 2, 2012Flaming Gorge, Utah, treated us to majestic canyon views sweeping down to the river & bighorn sheep at the campground. Flaming Gorge, WY – Absolutely spectacular, colorful views and friendly big-game animals September 30, 2012Flaming Gorge Wyoming has stunning lake and mountain views, and Lucerne Valley hosts friendly pronghorn and bighorn sheep. Pinedale, WY – A beautiful modern-day Boomtown September 29, 2012Pinedale WY is a fun, modern-day boomtown flying high from a natural gas boom with amenities worthy of a town ten times its size. Jackson, WY – The Wild West Tamed & Gentrified September 20, 2012Jackson, Wyoming, is a trendy town for the ultra-rich, but people watching and enjoying the sights are still free and fun to do. Ennis, MT & Earthquake Lake – Small Town Charm & Airstream Trailers! September 16, 2012After being charmed by Ennis Montana our RV crossed paths with an Airstream trailer rally and views of Earthquake Lake. Nevada City, MT – Rebuilding History in a Vanished Ghost Town September 11, 2012Nevada City, MT, vanished under gold mining dredges and has been lovingly rebuilt with original buildings from all over Montana. Virginia City, MT – Living History in a Ghost Town September 7, 2012Our RV travels included a stop at Virginia City, Montana where we discovered Montana’s rich gold mining history in a fun ghost town. Dillon, MT – Sculpture, History and Hot Rods! September 2, 2012In Dillon, MT, we found beautiful bronze sculptures all over town, and the Annual Cruise Night car show brought all the townspeople out. Big Hole, MT – Picture Postcard Perfect August 29, 2012Big Hole, MT, is not only an ideal camping spot with exquisite scenery, but is home to Jackson, a town built on hot springs. Darby, MT – Fun Surprises in the Bitterroot Valley August 25, 2012Darby, MT, home to ~750, sports a fabulous library (the “Sistine Chapel of Small-Diameter Wood”) a fun museum & funky Sheriff’s office. BitterSweet Guitars in the Bitterroot, MT August 23, 2012BitterSweet Guitars are hand-crafted in Hamilton, Montana, and we were lucky enough to tour this fantastic luthier’s workshop. Bitterroot Valley, MT – Traditional Roots in the Modern Age August 21, 2012The Bitterroot Valley is both traditional & modern: 3rd and 4th-generation ranchers continue their way of life even as the world changes. Mesa Falls Scenic Byway, ID – Pretty Waterfalls July 25, 2012Mesa Falls Scenic Byway, Idaho, is a beautiful drive through pine woods to two lovely and unique waterfalls – one gets a rainbow! Afton, Wyoming – Cowgirl Town! July 20, 2012Afton, Wyoming, is a classic cowboy town, with a famous elk antler arch welcoming visitors and a shoot-em-up cowgirl directing traffic. Bear Lake, UT – The Caribbean of the Rockies July 15, 2012Boasting bright turquoise water, Bear Lake, Utah, is rightfully known as The Caribbean of the Rockies! Mirror Lake Scenic Byway Utah – Fishing and Fun! July 8, 2012Mirror Lake Scenic Byway (Utah Route 150) passes beautiful mountain forests and crystal clear alpine lakes.